At 4:30 Pacific, the College Football Selection Committee released their first draft of who they believe are the Top 25 teams in the nation. There were some surprises, some no-brainers, but the best part of the rankings being released was the first glimpse into the decision process of the CFB Playoff Committee. On their website, it is mentioned that the committee will emphasize head-to-head wins between teams, strength of schedule (SOS), conference champions, and record versus common opponents. 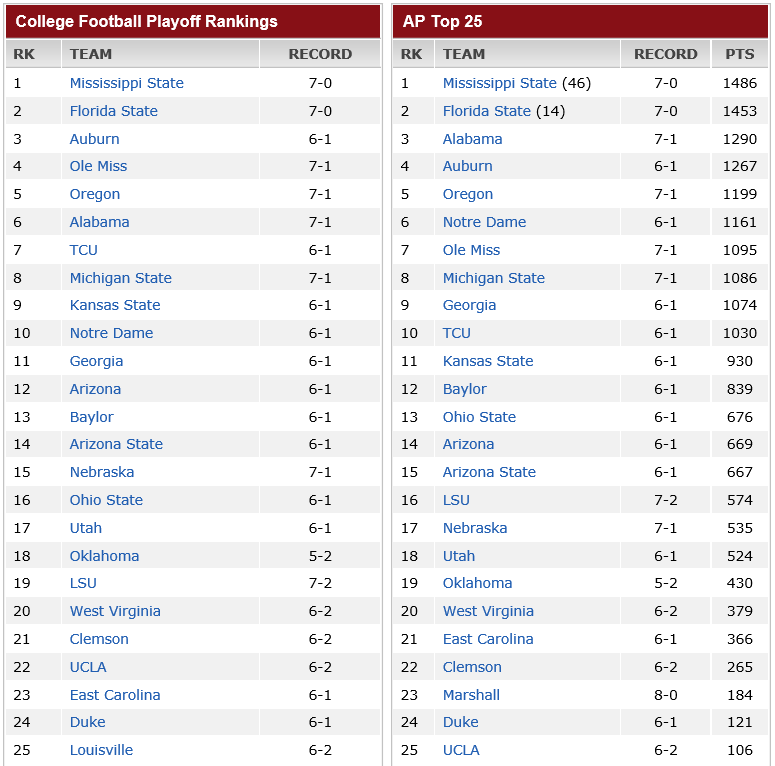 The following are the rankings from the CFB Selection Committee and the AP Poll. The rankings on the left signify the new-era thinking of college football, while the rankings on the right represent the “old way” of thinking. There are some stark contrasts that are interesting to note. The first thing that really sticks out is that Alabama and Ole Miss have essentially switched positions on the two polls. As we are used to, Ole Miss dropped out of the top four (the four teams that would advance to the playoffs if the season ended today) because they lost last week to LSU. They didn’t drop very far, though, because it was only by three points at a very tough LSU environment. Alabama rose quickly, despite the loss to Ole Miss, mainly due to a blowout win against Texas A&M. The Committee saw things differently. Ole Miss beat Alabama a few weeks ago 23-17. Even though they lost to LSU, Their defense has been staggering and they have beaten a few quality opponents along the way. Ole Miss takes on #3 Auburn this weekend, but a loss for either team might not make that much of a difference depending on the score of this game along with Oregon’s, Alabama’s, and TCU’s games. Notre Dame played one of the more exciting games of the season against FSU which ended in a controversial offensive passing interference call that negated the go-ahead touchdown. That call becomes even more controversial as it looks like the Selection Committee dinged Notre Dame pretty badly due to it being the only quality game on their schedule. If Notre Dame has any chance to make the top four, they need Arizona State to continue its streak and hope that USC and Louisville make up some ground in order for their SOS to rise. Arizona and UCLA have had some pretty exceptional losses this season that really quelled their campaigns in the AP Poll. Arizona beat Oregon in Autzen Stadium, but the next week they faltered against USC who has had a disappointing season thus far. This dropped them out of favor pretty quickly from their #10 ranking. They are #14 in the AP, but are now #12 in the CFBP moving above Baylor and Ohio State Similarly, UCLA lost to Utah at home and were dominated by the Ducks in back-to-back games, dropping them from playoff contenders to barely hanging onto a #24 spot in the AP. For whatever the reason, the CFBP Committee saw fit to put UCLA at #22 (famously the rank Michigan State was last year at this time before they rose to a top four rank by the end of the season). I personally don’t believe UCLA has enough strong games left to rise 18 spots, but the parity this year could allow some teams to falter and allow them to sprint up the rankings especially if they win the Pac-12 championship. Simply put, they lost to an underwhelming Virginia Tech team at home early in the season. The committee does not seem to be very forgiving about injuries to key players or current hot streaks (currently on a five game winning streak with an average point differential of 32.2, albeit against unimpressive teams). Ohio State’s only chance is to continue this stellar performance and win handily against Michigan State while winning the Big 10. I do like the CFBP Committee’s rankings. I personally thought teams like Oregon, Notre Dame, and Baylor were going to be a touch higher, but I can see why they weren’t given the rankings of other teams in similar situations. I am a tad disgruntled that there are so many SEC West teams in the Top 6, but I believe they will even out after they have beaten each other up (Auburn/Alabama, Ole Miss/Miss St., Auburn/Ole Miss and Alabama/Miss St. have yet to be played). I am excited that this era of college football is now upon us, and I do hope there is a two or four team expansion within the next five years.